James Essig always had interest in interstellar travel. His interest in manned space travel grew after reading a book on real-world potential interstellar travel methods based mainly on known and well-established physics. With his educational background and personal theoretical research, he offers proposals on how light-speed travel would affect the relationship between a spacecraft traveling at the speed of light and the universe through which the craft travels. 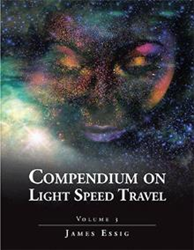 Essig’s ideas are presented in “Compendium on Light Speed Travel: Volume 3” (published by Xlibris). Readers may visit https://www.xlibris.com/Bookstore/BookDetail.aspx?BookId=SKU-001185183 to purchase and know more about the book. According to Essig, the overall theme of the book is the exploration of special relativity taken to extreme boundary conditions and it explains how and why humans may be able to, at some future time, travel at the speed of light. He believes that the book has social relevance because it displays a future filled with “wonderful developments” in science and technology. “I desire the reader of this book to be filled with a sense of mystique and of the whimsicality of the open ended future of truly extreme space travel,” he adds. James Essig holds a degree in physics from George Mason University. He has completed several graduate level courses in physics and mathematics as well.